In the latest Pink Carnation novel from national bestselling author Lauren Willig, rumors spreading among the ton turn deadly as a young couple unites to solve a mystery.... In October of 1806, the Little Season is in full swing, and Sally Fitzhugh has had enough of the endless parties and balls. With a rampant vampire craze sparked by the novel The Convent of Orsino, itIn the latest Pink Carnation novel from national bestselling author Lauren Willig, rumors spreading among the ton turn deadly as a young couple unites to solve a mystery.... In October of 1806, the Little Season is in full swing, and Sally Fitzhugh has had enough of the endless parties and balls. With a rampant vampire craze sparked by the novel The Convent of Orsino, it seems no one can speak of anything else. But when Sally hears a rumor that the reclusive Duke of Belliston is an actual vampire, she cannot resist the challenge of proving such nonsense false. At a ball in Belliston Square, she ventures across the gardens and encounters the mysterious Duke. Lucien, Duke of Belliston, is well versed in the trouble gossip can bring. He’s returned home to dispel the rumors of scandal surrounding his parents’ deaths, which hint at everything from treason to dark sorcery. While he searches for the truth, he welcomes his fearsome reputation—until a woman is found dead in Richmond. Her blood drained from her throat. Lucien and Sally join forces to stop the so-called vampire from killing again. Someone managed to get away with killing the last Duke of Belliston. But they won’t kill this duke—not if Sally has anything to say about it. Poor Penelope Deveraux. She has been usurped as my favorite Pink character by none other than Sally Fitzhugh. To be fair, I've loved Sally since her appearances as Turnip's fairly reasonable, levelheaded sister. I really enjoyed her evolution through the book, and now I want a stoat of my own. A stuffed one, of course. I will never be able to say enough about Lauren Willig and her writing. This was mysterious, hilarious, and heartwarming, and it reminds me very much like an Austen, where all things end as they should. (Je ne suis pas certaine des dates mais bon tant pis je l'ai eu en avril)Bref, c'est toujours bien écrit mais ici pour moi l'histoire a perdu de son originalité. Je lis de la romance depuis plus de 20 ans et je peux dire que c'était du déjà-vu et la grande partie du temps je me suis ennuyée 😔Bon point cependant pour l'histoire contemporaine dont j'aime beaucoup la tournure ! I liked this a lot more than I'd anticipated. Not so much for the actual plotline (I could really have done without the entire ridiculous vampire business, to be quite honest) but I was very much invested in the romance. That just worked for me. (view spoiler)[ALSO. The preview for Jack and Jane's book!! It made me happy. (hide spoiler)]And yay, I finished a book. Now I really need to show some self-restraint and not start anything new until I've finished one of the other ones. This isn't a critical review, but an observation: Despite the fact that this story, aside from some adjacent characters, had nothing to do with the League of the Pink Carnation, it is one of my favorites of the series! I loved Mistletoe and I love the Fitzhugh family, so the return of Sally was a treat. 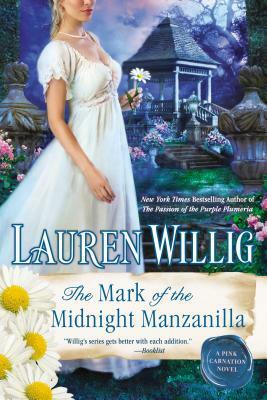 I didn't love Blood Lily, or Garden Intrigue, so I was a bit nervous about where this series was headed.But I have LOVED the last two -- Purple Plumeria & Midnight Manzanilla are both tons of fun. I especially enjoyed Sally Fitzhugh's delightfully determined character in this one. 1. Where were the spies?2. As far as this book's actual plot goes: derivative and boring, and yet there were glimpses of potential, mostly with regard to Lucien's backstory. Even that is wasted, though, or overblown.3. The best part of this book was the preview for the next book. 3.75. I liked it, but because I really loved Sally since TMotM I was looking for MORE. It seemed really short in story compared to others in the series. I hate that I'm slightly let down by this book. Dang it. I keep trying with the Pink Carnation series, and they just aren't my thing. They should be, but they feel too Harlequin romance for me. I adore this series. This one centres on Sally, Turnip's little sister, and Turnip makes an appearance. In my book, that's a win! Hilariously dysfunctional and loving characters take you fir another wild ride of intrigue. What could be better? Lucien, Duke of Belliston, is rumored to be a vampire, which is one of the reasons that you shouldn't believe everything you hear. Sally Fitzhugh is ready and eager to help him clear his name and catch the French spies who murdered his parents.Why I started this book: Some series are just really fun fluff.Why I finished it: I struggled to get back into the flow of the story, it's been so long since I read the last one. But it was fun and light, just what I had expected. My favorite so far! Only one more to go. The end of a wonderful series coming today. But "Mark" is just so funny. Sally Fitzhugh takes center stage in this one and she is just fabulous, smart and funny and loyal. Lucien does not stand a chance!! Gwen makes an appearance, as this is sort of based on her book, and a vampire craze right before Dracula becomes popular. A good mystery, many psychological truths, a lot of love. I will be sad when it comes to an end! These pink carnation books are frilly, silly fun!